Super Hero Boy: Helping you loose weight even through the Holidays! Helping you loose weight even through the Holidays! I'm not a big fan of weight loss gimmicks mostly for the reason that I've always doubted if they worked or because most systems are so hard to follow or keep up with. Sensa really got my attention for the sheer reason that it has the most unusual and quite possibly the most easy to use way in which you use it. 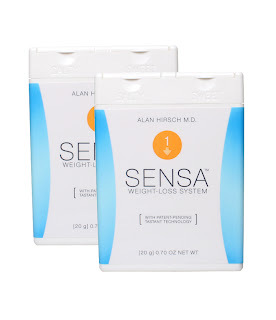 Sensa is a weight lost additive that you use with your regular meals. The system comes in two "shakers" which are basically flavoring type shakers called, Tastants, labeled salty and sweet. You use Sensa by sprinkling the salty additives on the foods in which you would usually use salt and a sweet shaker for foods in which are "sweet" such as desert items. The additives are built to help your body feel full faster and are masked by your food so they are virtually undetectable on the food you use them on and some even say that they make your food taste better. Due to some other issues I have going on at the moment medically I have yet to be able to try out Sensa for myself though I have been doing research on the system for a little over a month now and most users report loosing around 30 lbs after using the system for six months with little change in their diet or exercise program. However, of course as weith any diet system if you really stick to the plan, improve your diet, and add light exercise you could see much much more dramatic results. The Sensa progam is designed to be used over a six month timeframe. Though eating a healthy diet is always helpful Sensa can be used with your regular diet as Sensa works by helping the taker feel more full and thus eating less, not by drastically changing your diet. I would love to give the gift of Sensa to one lucky reader and hear how it works for you after the first month! With that in mind I am going to send one lucky reader their very own starter pack of Sensa so hopefully one of us might meet their weight loss goal before the year is over! heh. For the rest of us you can try Sensa for yourself and get 15% off and free shipping by using the code : ROCKETXL and purchase Sensa for yourself direction off the Sensa website! Leave a comment on this post. Check out the Sensa website and tell me how much weight you would like to loose and what you find attractive about the Sensa program. I have committed to lose 60 pounds. what I like about Sensa is the manner in which I can add it to my food - because it resembles a spice, I feel like I am not doing anything 'extra'. I'd like to lose about 50 lbs. I like that Sensa is sugar-free, sodium-free, calorie free, gluten-free, and that there are no stimulants or drugs in it. I would like to lose about 30 pounds and this sounds perfect for me. I could just add it to my food and it wouldn't even be dieting. Sounds good to me! Thank you! I like the fact that you don't feel like you are depriving yourself by using it. Unfortunatly eating makes me happy. I love food. So I need a little help in the keeping my portions down area. I had twins last year and I need to lose 100 pounds. I can't believe I said that online. Shows how much I would love to win this. Good luck to everyone out there. Hi there. I am a single mom, full time student, full time employee, 40 years old and am an insulin dependent diabetic. I recently discovered I have diabetic retinopathy. I have been morbidly obese since I was a kid - 5'1, 230lbs. I need to lose weight, get to a healthy range and stay healthy for the rest of my life (so I can watch my son grow, literally and use the degree that I'm working so hard for). I think normal range for me extends to 145lbs. The math there becomes OVER 80lbs of weight loss. Naturally, I'm more interested in health than thinness. I heard about Sensa and the doctor that spent his career working to offer this product. It seems that he wants to help people deal with the problem of obesity. I wrote a tag within the Sensa website asking for or offering myself as a pro bono case as I simply cannot afford anything outside of my budget (these days). They were kind and told me that it's just approximately $40 monthly. No takes on the offer to just "help me" out. They did however, give me the link to YOUR website, owing that you have a sweepstakes going on and that I'd do well to enter the contest. This is my entry. For ME, this is a matter of health. Being over 40, though just, and finding out recently that I will go blind if I don't DO SOMETHING to slow down that process, I'm in a state. What more can I do? I work from 8am-5pm and attend full time college most nights, plus homework, projects and raising a 10 year old? I hardly have time to eat small healthy meals all day and exercise - though I realize it is another part of what is needed to live a healthy life. I'm no superwoman; but with this product I may just have the energy and vitality to really do well in my life, finish what I've started, see my son grow to a happy healthy adult and avoid being blind in my 50-60's. I hate to use the word desperation so I won't. I would like to say that I'm determined. Thank you for offering this to all of us. I'm sure the one who receives this gracious offer will start a new life. Of course I hope it's me; but I will be happy knowing that you're helping someone who really needs this and can't afford it. It seems a rarity these days that people help others with no real want for themselves. I'm glad for the opportunity. I would like to lose 100+ lbs. Sensa sounds very interesting and might actually work for me. Would love to have the opportunity to try it. Thank you! I would like to lose 30 lbs, and my mom needs to lose about the same. I'd LOVE to win this!! I love the fact that it is so easy, and comes with salt and sweet additives to use with either food. This would be awesome to try! Thanks!! I really need to lose over 75 pounds. I would be happy with 50. I like the idea of it not changing the taste of the food I eat. I would really like to try this Sensa. It sounds very interesting. I would love to loose about 50 lbs. I would really like to see if this really helps you to feel full faster. Please enter me, I'd really love to give this a try. Thanks. I HAVE ENTER TWO OTHER CONTESTS FOR THE SENSA AND LOST BOTH. HOPE THE THIRD ONE IS THE CHARM. I NEED TO LOSE ABOUT 100 LBS STILL. I HAVE LOST 68. BUT NOW MY BODY IS FIGHTING ME, I CANT SEEM TO LOSE. I NEED MORE HELP. I STARTED AT 311. SO I HAVE A WAYS TO GO. I would love to lose about 60 pounds! (YIKES!) What I like about it most is that it is just an additive to your regular food. And if the taste is good, maybe it will stop me from using salt or sugar altogether!! That alone will go far in aiding my weight loss! 30 lbs would be nice to use, and this seems like a simple way to help me do that. Embarrassed to say 60 lbs. I like that it helps to overcoe the biological drive to overeat. About 30, I like that I can just add it to my food. i have got a lot to lose, i was disabled and not able to exercize for quite a while, so 100. now i am able to exercize but i still have to lose. this program looks to be one of the easiest to follow. thanks for the opportunity. would like to lose 20 lbs, it is easy, and comes with salt and sweet additives to use with either food. I like this that I read on their site: "The Sensa Weight-Loss System addresses this problem of our evolutionary past by using the human senses of taste and smell to help us gain greater satisfaction from a smaller amount of food." Seems like common sense. Common sense I could use after a year of serious weight loss efforts on my own has not yielded the results I need. I need to lose 25 pounds (possibly more after the holidays). I think that what I like most about Sensa is that fact that it is supposed to make you feel full/satisfied with less food. My main weight loss problem is that by the time I feel full during a meal I've eaten WAY too much. If the full sensation started sooner I would be less inclined to eat that third helping..hehehe! I need to lose 35 pounds. I like the fact that you eat what you normally eat, just add a sprinkle. It sounds so easy! I subscribed to your feed using my yahoo. Thanks! I need to loose 28 lbs and I like that you use sensa with your regular meals. To start I'm going to try to lose between 15 and 20 pounds. I like how simple the system is - and that it's not gimmicky like the others. Seems like common sense. Common sense I could use after a year of serious weight loss efforts on my own has not yielded the results I need. Thanks! I'd love to lose about 15 lbs. I've tried everything to get it off, and I know it's not a LOT but it's annoying. this looks great. I'd like to lose 10 pounds and I like that it's just an additive, sounds pretty easy. I would love to lose 10 to start off, but need to lose way more. I like that it's not a pill or a nasty drink. I would love to lose 20 lbs and that would put me at the weight I graduated high school. I walk every day to no avail....3 miles in 30 minutes. Maybe Sensa would speed up the process. Somewhere between 60 and 80 pounds. I would like to lose about 25lbs and I like its ease as you can just ad it to your food. Oh, wow1 I sure could use some of this!I just went to the doctor the other day and she informed my I had gained 10 lbs. since my last annual and 10 lbs. the year before also! So I would like to start with losing those 20 lbs immediately and them working real hard to lose another 10-20 lbs. Sensa sounds like a great product and sounds like something that would work for me. I would LOVE to lose 25 lbs. I like the idea that you can add to the food and not taste it. I also like the fact it helps your body feel full faster. I would love to lose 40lbs, maybe a little more, but at least 40 and I love that Sensa has no stimulants or drugs in it! I like that you can just sprinkle Sensa on your foods! Sounds simple enough! I want to lose 20 pounds! i want to loose 60 lbs because i have heart disease.I've tried other weight loss things. this sounds like it would work for me. This would definately help me with my weight loss goals. I would like to lose about 20 pounds. Sensa sounds so easy to use that's what is appealing to me. Thanks for the contest. Happy Holidays. I need to lose about 50-70 lbs. I would love to try Sensa since it would trigger the "feel full" feeling. That's great that Sensa can do this! my goal is to lose about 75 pounds, im close to 200 right now, so at 5ft tall my ideal weight is about 115.
i think the fact that you can mix this in with food is pretty amazing. i already take so many pills in a day that adding a diet pill would just drive me bezerk. I've been very overweight all my life. I need to lose about 100 pounds total, but I'm setting a goal of 20 pounds for this year. I have to make it attainable so I'm not so overwhelmed by that massive number. If it really works and it kills the cravings, well that would be really great about this product. I'd love to give it a try. Thanks for the great giveaway. Wow, what perfect timing. I'm really tired of how I look/feel and am ready to do something about it. I already plan on eating healthier and moving more, but Sensa seems like an easy way to supplement my efforts. I need something easy to use and this looks like just the thing for me!! Thanks for the chance to win this! I want to lose 20 pounds. The Sensa system appeals to me since it is so easy to use. I would like to lose 30 pounds. I like that this doesn't change the taste of food, just restricts appetite. I would like to lose 80 lbs but I would be happy with 35. I find adding it to your meals like seasoning very appealing. I would be happy loosing 60 lbs, I started dieting by wathing what I am eating and have lost only 3 lbs in 8 weeks. 30 lbs in 6 months sounds more like it!!! I like that it doesn't have side affects! i would love to lose the 20 lbs i put on while pregnant. this seems like a very easy thing to do and would also help my husband:) thanks! i would like to lose 10 lbs and like that there are no stimulants. I would like to lose 80 pounds and I like it because you can add it to your meals and its not like your dieting! I need to lose 25 pounds from my last baby (who's 17 months now!). I like that it helps you feel full faster. I have already lost 33 lbs, but I need to lose 20-25 more. I'm not filling full with anything right now, so I think this Sensa system would help with that. And I like that there are no food restrictions. Plus, it does not directly affect the digestive system which is good for someone like me with stomach issues. I would like to lose about 80 lbs. I like that fact that this system caters to the two most common cravings (Sweet and Salty) people want while they are dieting or trying to eat healthy. I believe this system could aid others while they try to reach their goals. I would certainly love to try this. I like that it won't change the taste of my food. I'd love to loose 10-12 pounds. I need to lose about 50 pounds! It sounds like a really great product in that you just add it to the food you are eating - I would love to try it! I love that it's not a diet and I can continue eating normal food, it sounds fabulous! I would like to try this since I still need to lose 20 pounds after having my son 14 months ago. I can't seem to lose the weight with just my own diet and exercise and need some help! I'd like to lose about 50lbs and I love this idea because you just add it to the foods you are already eating. No meal plans to follow, no calories to count etc. Sounds great! Thanks for the chance to win some! I need to lose at least 5 pounds. I need to lose a LOT of weight. This looks got for my active life. I need to lose about 20 lbs. and this sounds ideal, if it really works. I like the fact that you don't have to change anything but sprinkle it on your food. 40 pounds - I like that you do not feel deprived. I want to lose 40 lbs, I like it because it seems really easy! I need to lose around 50 lbs. I love the fact that you can add saltiness or sweetness to the products. 20 pounds and it's portable so I could carry it in my purse. i'm not really looking at a number i just know that i have to lose weight! what ever healthy is for me. I want to lose 55 pounds. I like this program because it doesn't require any special foods and you don't have to attend meetings. What a great concept. I would be so excited to try it. I've lost 20 pounds and still have 45 to go. I would love to try this to help things along. I like that you can just add it to your food and that it doesn't contain any drugs. I need to lose about 10 pounds and I'll be happy. I like the Sensa isn't a drug! i need to lose at least 50 lbs. i like that it is so easy to use. I would like to lose about 15 pounds. I like the way that you use it with your regular food like salt and sugar! Thanks for the great contest! 30 pounds. I like that it is not a drug and contains no stimulants. I need to lose at least 30lbs. I was reading on Sensa about a month ago. It sounds great if it works. It is something I would like to try but hate to spend the money for something that doesn't work. I need to lose about 50 pounds, and have been having such a horrible time. I have tried others with no luck. I like that Sensa is not a product that is going to pump you full of caffeine. Those are not good for you. I need to lose over fifty pounds. I was in a car accident quite awhile back already and it really slowed me down. I gained almost 70pounds. It has been very frustrating. I try to eat healthy and exercise but the pounds just are not coming off. I feel Sensa could give me the extra boost i need to lose weight. I like that its a food additive. It can be either a sweetener or like a adding salt to make a person feel full faster. Sensa appears safe and successful. Count me in. I need to lose 15 pounds. I like that Sensa is sugar free. I would like to lose at least 50 lbs. With Sensa, there are no food restrictions. It is designed to help you overcome the biological urge to overeat, so you can reduce your calorie consumption and lose weight while continuing to enjoy the foods you love and feeling fully satisfied. It works gradually, with no shock to your system. I like how it is so simple to add it to my food. This would be nice to try. I could stand to lose 50 pounds. With all the stress I went through I gained A LOT. I need to loose 100 lbs! I would settle for 35 for now! I need any help I can get! I stress eat & have bben so stress out since hurricane Ike. I have gained 35 pound in 5 months. I swear I think they put stuff in those MRE"S meals that make you gain weight. I would like to lose 30 lbs. It sounds like it would help me feel full. I would like to lose 10 pounds.